I am not a particularly strategic reader. Okay, that isn't entirely true, but I don't feel strategic when I choose books. I do make an effort (although it's hardly a chore) to read predominantly female authors and also focus on Canadian lit. This doesn't mean I won't read men, or that I don't read international offerings, but there are a lot of books out there and, consciously or not, most readers have a way of narrowing down what makes it into their to-be-read pile. Sometimes genre can be enough, but whatever way you choose your next read, chances are that a strategy is involved. In the last while, part of my strategy has been to read more short story collections. I really like short fiction, so it has been a happy turn of events that CanLit Knit has embraced short stories as well. Most recently we read Miranda Hill's Sleepy Funny, and although it wasn't everyone's favourite so far, it was mine. The first story is set in a tony neighbourhood in a city I feel I should recognize, but can't quite (it could be Toronto or Vancouver, or a fictional mash up, but I'm not sure it quite matters). The neighbourhood is a cul de sac on which all the families are friends, the women are all successful, and everyone follows a sort of unwritten code. And then a new family moves in. The premise is not unique, but the way the story unfolds is nonetheless satisfying in the way Hill uses and subverts the tropes were accustomed to. The story is told from the perspectives of several of the women who live in the niehgbourhood, offering insight into their lives and children and views of the new neighbour, Michal Revivo-Smitherman, her husband, and their three children. In a story like this – where Michal's perspective is never given – it would be easy to make her a sort of manic pixie dream girl for the neighbourhood, where her bohemian life inspires the other women to change and her character remains nothing more than an archetype. But Michal is very much a person in this story – the longest in the collection – and by the end you feel you know her as well as you know the other women. By and large, this is a story about how neighbourhoods work – those tacit agreements we make to keep the peace and ensure property values remain high. It's a sort of domestic drama, and Hill's teasing out of the small details is beautifully done. By the end of this first story, you really think you know where Hill is going with Sleeping Funny, and then you start the next story and find yourself somewhere entirely different. It's a jolt, but it isn't jarring – it's refreshing, really, to read a collection that really is just that. This is not a series of connected short stories or a collection of work in a certain style or on similar themes (although there are themes that run through many of the stories, family being one), but rather a collection of various stories that can be read individually or all at once. It has been a while since I read a collection whose stories weren't group by theme or style, and it was fun. I would like to say that I had a favourite, but each story, in the moment I was reading it, defined the collection for me. The only weak link (and weak only in the context of how strong the rest of this collection is) was the titular story, which is also the last. It felt a little more obvious, a little more set up and spelled out than the other stories, but the writing was still so engaging I didn't really mind. 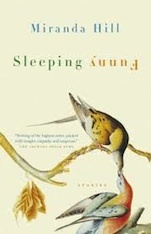 Sleeping Funny is a collection I will hold on to so I can reread its stories in five or ten years. I suppose that counts as a strategy for reading, but I'm okay with that; I can only imagine this will get better with time.